If you’ve been reading this blog for a while, you’ll know about my love of string and you won’t be surprised to read that I was very excited about the prospect of using it for crochet. When my friend Sarah introduced me to dishcloth cotton a few weeks ago I was captivated, especially since she simultaneously gave me a pattern to knit a string bag complete with its own storage pouch built-in and forming the base of the bag. The pattern for this bag originates from the 1940s, but similar patterns can be found on Ravelry. My only problem to begin with was that my local yarn shop had sold out of dishcloth cotton, so I had to restrain myself. Of course I could have ordered some over the internet, but I stuck to my guns and waited until it was back in stock locally. I suspect that it won’t be my last, although I will modify the pattern a bit next time. Plus, having got the feel of it, I now know that Sirdar Simply Recycled (a mix of cotton and acrylic) will be suitable, and I have several balls of that left over from previous projects. Here in Wales, shops are no longer allowed to give out plastic bags for free, so there has been an increase in people having their own shopping bags. I can think of lots of folks who could make use of a few of these. And even where plastic bags are freely available, something like this is a much better option if you are trying to be sustainable. I felt compelled when the washing line that we inherited with the house finally gave up the ghost to splice the ends when I fastened it to the wall and the post. – So much nicer than just tying a knot. You see, it’s not just me who wants to treat their string right! Love the pouch – intrigued by how you made it…..
What a lovely dish cloth and bag! You have brought back so many memories for me. 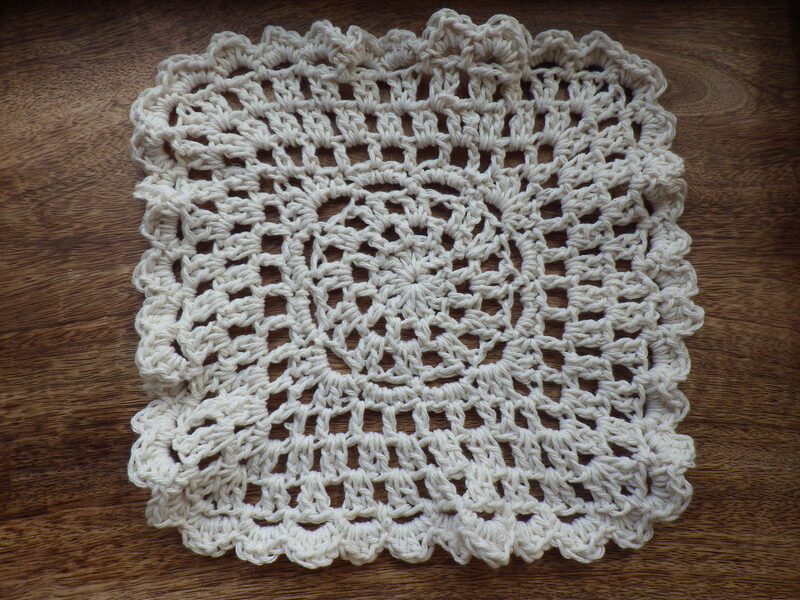 My Grandma, who I lived with as a child, used to crochet bags from dishcloth cotton. They were so good that my teachers all asked her to make one for them too. I so wish I had the pattern. I do have her old hard backed copy of a book of patterns though, but it does not include the bag. See my answer to ‘I am simply hooked’ for a couple of similar patterns. I am really taken with these bags.. I suspect there’s going to a big demand for them from my friends! I’m sure you can… they are quick to do and you can easily adjust the size if you want. I have to unravel the sweater first! And that has to wait until the chaos here dies down. *sigh* But it’ll happen. It’ll happen. Eventually! hahaha! Thanks for visiting Shelly the Snail, I am so pleased you liked her. I love your sweet snails in your banner too. Do you have a pattern for these little critters? Sorry I got my comments the wrong way round! Thank you for sharing the link to this bag pattern, It’s greta the way in folds into itself. No problem… really easy to make! Look out, you’ll find yourself making a whole string of them. Pun entirely intended… I’ve made shopping bags out of charity shop pillowcases which fold/roll up into a small package, and I always have a little pouch in my handbag which contains a rather snazzy purple shopping bag. There’s nothing quite like refusing plastic because you’ve got fabric! I’ve got lots that I’ve made out of fabric (https://thesnailofhappiness.com/2013/11/18/in-the-bag/ for a rare post about sewing!) but this is my very first fibre one… and certainly not my last!! You should sell these, great wee bags! I just found some fantastic Welsh Dragon socks on ebay and they’re made from a pattern of this site https://www.etsy.com/uk/shop/TeaCosyFolk?ref=si_shop they had such nice things there I thought you might be interested. I also found this offer which could make the patterns very cheap? Maybe Mr SoH might like the socks? Brilliant socks… thank you for the link! This is very cute. I am not sure what dishcloth cotton is. I suppose you need a yarn that doesn’t have very much give — like string itself! It’s also called craft cotton – there’s no give in it and it’s not too silky. For the bag, any strong, non-stretchy yarn would be fine, but for a real dishcloth I think the genuine unbleached dishcloth cotton is best as it can be washed at a high temperature.